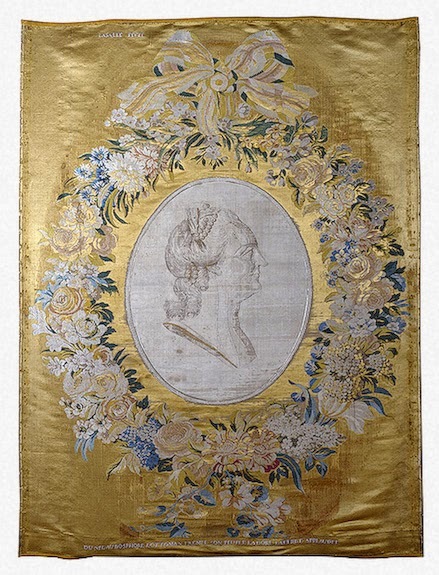 This portrait in silk of Catherine the Great, dating from 1771 and now in the Hermitage, represents a virtuoso technical feat: it is neither an embroidery nor a painting but an image actually woven into the fabric. 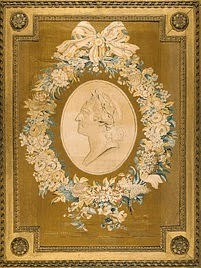 (The grisaille bust is, I think, a separate piece of silk stitched onto the gold background.) As the "LASALLE FECIT" proudly proclaims, it is the work of the celebrated Lyon designer Philippe Lasalle, and it was sent to St Petersburg by none other than Voltaire, who is the author of the obsequious verses (commemorating Catherine's recent victories over the Turks). 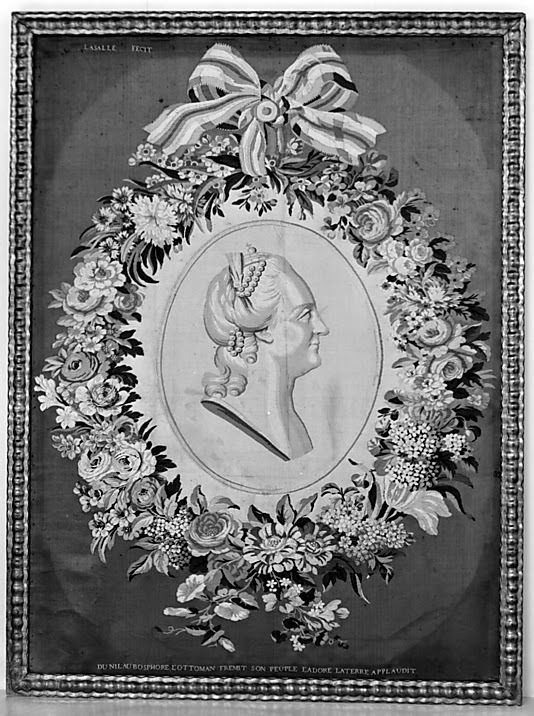 In May 1771 the Princess Dashkova, visiting Ferney as part of an extensive European tour, had admired a portrait in Voltaire's own possession. On 15th May Voltaire wrote to inform Catherine that he had arranged for her to receive a copy: "Madame, I must tell you immediately that I have had the honour of receiving Princess Dashkova in my hermitage. As soon as she had entered the salon, she recognised your portrait in mezzo-tinto, made with a shuttle on satin, surrounded by a garland of flowers. Your Imperial Majesty should have received one from Sieur Lasalle; it is a masterpiece of the arts that are practised at Lyon......"
The portrait had evidently become one of the sights of Voltaire's house. The Duchess of Northumberland described it clearly in 1772, although she mistook it for an embroidery. 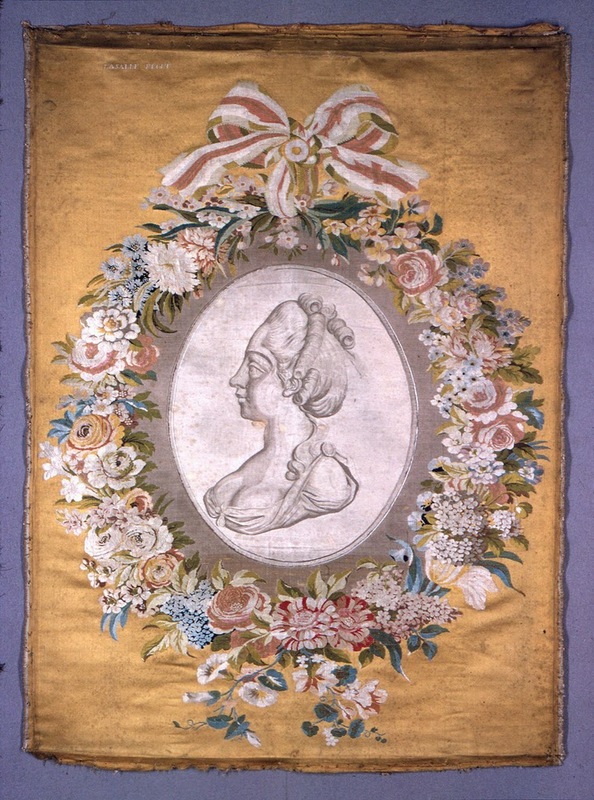 It can also probably be identified with the otherwise unknown "life-size portrait of the Empress Catherine II embroidered in petit point by herself" described by Voltaire's secretary Wagnière. In 1967, when Edith Standen published a study in the Metropolitan Museum Bulletin, the original portrait from Ferney was still extant and in the possession of Mme Pierre Lambert David, whose family owned the château. According to the Dictionary of pastellists it is now in the collection at Ferney, though I haven't been able to corroborate this. Other examples exist in the Metropolitan Museum (acquired in 1941 from the collection of Mrs. Henry Walters) and in the Musée des Tissus in Lyon, which apparently also possesses (or possessed) Lasalle's original design. 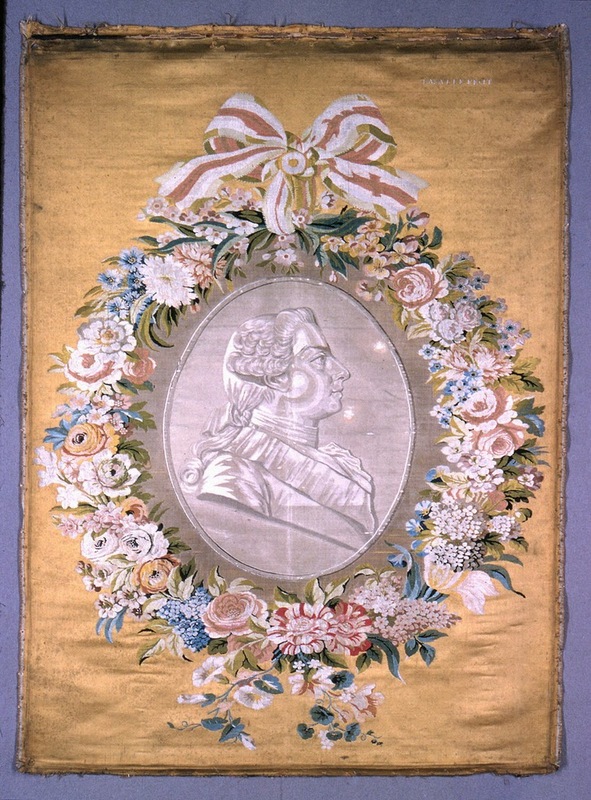 In 2012 the museum displayed the silk as part of an exhibition of woven portraits entitled La Fabrique des grands hommes which also included a Louis XV by Lasalle. (You can find Louis on their website, but not, as far as I can tell, the Catherine.) Another copy, in the Schossmuseum Berlin, was destroyed during the Second World War. Smithsonian's Cooper-Hewitt, National Design Museum. Why, though, the Catherine? Again, it seems likely that Lasalle, who was the associate of such Enlightened ministers as Turgot and the younger Trudaine, was the instigator of the portrait. According to Edith Standen, the copy at Ferney was embroidered, "Presented to Monsieur de Voltaire, by the author". There is also a letter dated March 24 1771 in which Voltaire sends his verses to M. Tabareau, director-general of the post office at Lyon: "Here, Sir, is the shortest thing I have been able to compose for your protegé; and in such cases the shortest is always the best." The letter is endorsed, presumably by the recipient: "Verses intended to be placed at the foot of a portrait of the empress of Russia made at Lyons on the loom by M. Lasalle, manufacturer ["par les soins de m. Lasalle fabriquans"]." No doubt Lasalle also had his eye on the lucrative Russian market and indeed, Catherine the Great subsequently became an important patron. 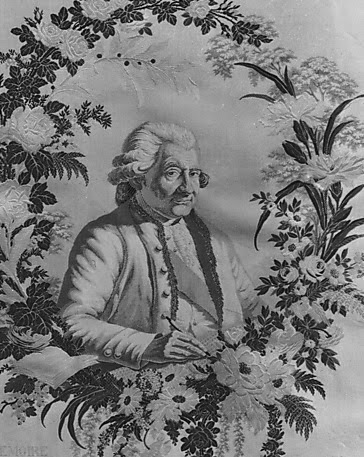 The original on which Lasalle based his bust is not certain; this portrait by Fyodor Rokotov dating from 1769, features similar hair decorations. Edith Standen suggests a print by Louis Bonnet after an original by Jean-Louis de Veilly (from the coronation in 1763), but I haven't been able to trace this. "In memory of Philippe Lasalle"
Edith A Standen, "The mistress and the widow" The Metropolitan Museum of Art Bulletin, 25(5), 1967 p.185-96. Notice from the Metropolitan Museum on Lasalle's "Partridges"